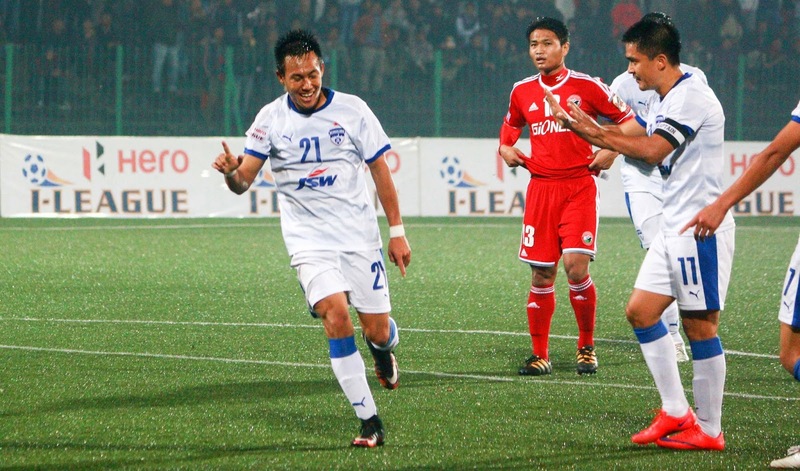 Bengaluru FC broke the jinx beating Shillong Lajong FC by unassailable margin of 2-0 in the Hero I-League encounter at the JN Stadium tonight. Goals by Udanta Singh (36') and Kim Song Yong (82') in either half summed up the first win for the Steelmen over the Reds in Shillong. Earlier, youngster Udanta Singh started on a high note for Bengaluru FC to make a breakthrough in the fifth minute when he smashed just wide of the nets. Bengaluru continued to press hard but the efforts by John Johnson and Kim Song Yong were unable to bear results. Udanta, meanwhile, had another unsuccessful shy at the nets in the 20th minute. He was finally rewarded 6 minutes after the half-hour mark when he found the back of the net from close range in the second attempt. The free kick by Osano was received calmly by Kim Song Yong and delivered towards the youngster who did no mistake to net his maiden goal of the season. Luck was surely not with Lajong today, two minutes into the second half, the Reds were deprived of a certain goal when Samuel Lalmuanpuia's screamer rattled the crossbar. Bengaluru FC, meanwhile, balanced out their tasks by then and were doing well on both fronts. After being turned down for an offside in the 80th minute, Kim Song Yong made sure he features in the scorers' list with a thudding header a couple of minutes later.